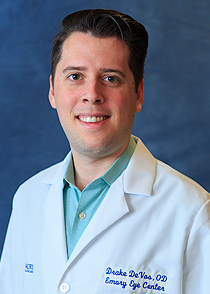 Drake DeVos, OD, joined the optometry section of Emory Eye Center in September 2018. He provides comprehensive eye examinations that include evaluations of ocular health and prescriptions for eyeglasses and contact lenses. Dr. DeVos attended the University of Alabama, where he earned a Bachelor of Science degree in Biology and a minored in General Business Administration. He then studied optometry at the State University of New York College of Optometry and graduated in 2017 with his Doctor of Optometry. Following optometry school, Dr. DeVos completed a one-year residency in ocular disease/primary eye care with the U.S. Department of Veteran’s Affairs in the Hudson Valley area of New York. His other experience includes several optometry internships where he helped with pre- and post-operative management of cataract, LASIK, and anterior segment procedures. He also helped treat and manage glaucoma, macular degeneration, diabetic retinopathy, and corneal degenerations/dystrophies. Dr. DeVos is a member of the Beta Sigma Kappa International Optometric Honor Society, the American Academy of Optometry, and the National Association of Veteran’s Affairs Optometrists.